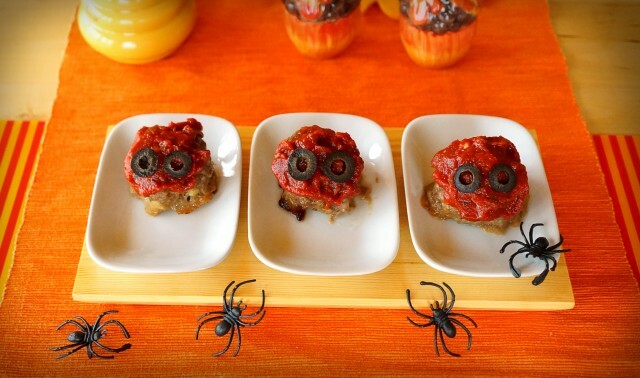 Great fun dish for a Halloween! 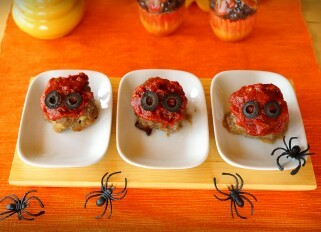 My kids had so much fun decorating their own Spooky Meatballs. Meatballs turned out juicy, tender with a nice smoked flavor because of the bacon. In this recipe I used Pecorino Romano cheese, but you can use any other firm cheese. And instead of ground beef you can use chicken or turkey, depending on your taste and diet. These meatballs can be served with mashed potatoes or spaghetti. 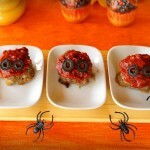 Making food for Halloween can be so much fun for you and for your kids! Finely chop the onion, garlic and bacon. Soak 2 pieces of toast in milk. Heat the oil and fry the onion over medium heat for about 10 minutes, then add the bacon, stir for 3-5 minutes, then add the garlic and cook about a minute more. Turn off the heat and let cool. In a large bowl mix the ground meat with toast, egg, cheese, nutmeg, roasted onions, bacon and garlic. Season with salt and pepper. Form the meatballs slightly larger than a golf ball. Place them on a baking sheet and be sure to keep them separate from each other. Place the pan in a preheated oven 190'C (375F) and cook for 30-40 minutes, depending on the size of the meatballs. To prepare the tomato sauce, finely chop the onion, garlic, and herbs. In a frying pan pour the olive oil, stirring all the time the onions, basil and oregano for about 5 minutes, then add the garlic, paprika, salt and pepper and cook for another 1-2 minutes. Pour the wine and let evaporate a little, then add the tomatoes and sugar, stir, bringing the mixture to a simmer. Then reduce the heat and simmer, covered, for 45 minutes, stirring the sauce occasionally. Place the meatballs on a plate, pour the sauce on top and decorate with olives.